There are many situations when we need to keep our computer running without using monitor. It usually happens when we are downloading any large file or when we are leaving our computer for a short while. In such a case, most of us leave our computer monitor turned ON even though it is not required until the power saving system automatically turns it off after some time. Monitor consumes a significant amount of power. So, turning it off when not in use will save power. You might be thinking "why not use the button provided to turn off our monitor?" Yes, you can do that way but not always. It can cause wear and tear and the button may get damaged sometimes as it has happened to me now (esp if you had an old monitor). Also, this button is not provided for most laptops these days. In this article I will tell you an easy solution to turn Off your monitor on Linux. Unlike other operating systems like Windows, etc, Linux (X.org) provides an easy way to do this. We can turn off the monitor by running the following command from CLI (terminal). But opening the terminal and rememering and typing this long string often is quite painful. I use Linux for most of my work. I used this command for quite a long time hesitantly to turn off my monitor. Whenever I use this, i always used to question myself "Why not make it more simpler?". At last, i made it a bit simple. I felt it would be a better approach to have an easy to access button to do this. I have made a small program to solve this problem. 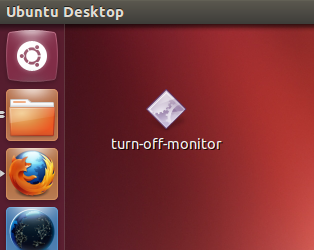 Download this tiny utility "Turn-Off-Monitor" and put it on your desktop (after unzipping). Run the executable by double clicking on the icon to turn off your monitor. You can wakeup your monitor again by simply pressing any key or by moving your mouse. I have tested this on Ubuntu 12.04. However, this utility should work on most Linux distributions like without any problem. The system function is used to execute the execute the operating system commands. I hope you understood. It looks simple but quite useful. I think it can also be done using shell script, etc too. I would like to hear more about this from you. Would'nt it be cool if we have a keyboard shortcut for this? I have tried a tutorial from HowToGeek for this but it did not work for me. Please share your suggestions on this. to create a desktop shortcut for turning off your monitor. But let me warn you that nircmd.exe is considered as potentially dangerous application by a few anti-malware softwares. There is one more application called sleeper for windows which I did not try. I hope you like this. I would like to hear feedback from you regarding this article. Please leave a comment below. Why in the name of baby jesus did you write a C program just to run a system() call? Because I do not know shell script. Dear Deekshith, your executable idea works better than the shell script. Thank a lot for that. The above two lines is the shell script to do this task. It works but the problem is that it always opens a dialog box asking whether to run it or not. So, your approach of making an executable is better. Before I saw your post, i used to use terminal to do that.